BTW – The Prestige Eyeliners are FANTASTIC – I have tried buying many other cheaper eyeliners and they just don’t compare. I have been waiting for these to go on sale. They are still on for $3.49 this week as well. I was back at London Drugs this morning to get some of the $2.99 St. Ives lotion – I really love this stuff and have been waiting for it to go $2.99 again at Shoppers Drug Mart. Was happy to see it in the London Drugs flyer. While I was there I noticed some more U by Kotex products on for $4.00… twice the size of the boxes I bought the other day for $3.99. Darn. I only had one stack left but was able to print a few more coupons and decided they were worth getting even without stacking. Wish I had of waited on my stacks though… all well, what do you do. 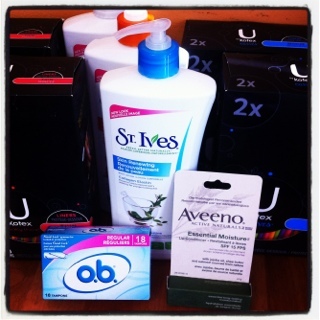 I just can’t say no to these U by Kotex coupons and deals – I hope I never get another one of these coupons again – I should be well stocked for a while, more than awhile. 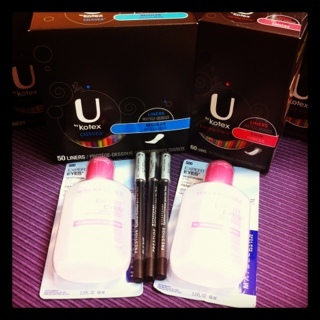 If anyone is wondering the U by Kotex liners are awesome, the best I have ever tried but their tampons are terrible. Also decided to grab a box of O.B (they are awesome) for the free Aveeno Essential Moisture Lip Conditioner – I keep missing the Living Well giveaways and really wanted to try it. I have already tried it – really like it. Some good savings this week – but I really need to stay out of the feminine product isle – maybe I should just stay out of London Drugs. This entry was posted in canadian coupons, coupon stacking, coupons, london drugs and tagged canadian coupons, coupon stacking, coupons, london drugs on March 3, 2012 by Courtnie.